Ballerina Birthday Party Ideas for a ballerina or ballet birthday theme party. 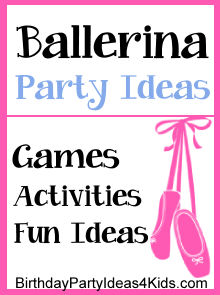 Great ideas to make the party extra special including ideas for ballerina decorations, invitations, games, activities, crafts, party food, ballerina party favors and more. Also included is an easy "no-sew" guide to making tutu's for the birthday girl and all of her guests. 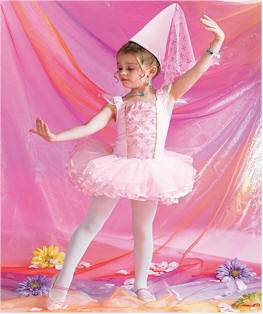 See our Ballerina Tutu craft page for complete instructions. Use the tutu's as party decorations or a fun wear and take home party favor! Cute cards with ballet shoes or pink cards with ribbons. Or: Create a scroll for the ballerina birthday invitation and tie with a pretty satin ribbon. Ask guests to wear their leotards or one piece swimsuits if you will be making tutus. Decorate the house in pink and white with touches of light blue. Pink and white helium balloons - blue curling ribbon. Pink tablecloths with white or pink tulle around the edges tied with ribbon and plastic flowers. Sprinkle pink and silver confetti on the table. A fun idea is to blow up lots of pink, white or silver balloons (lots and lots!!) and scatter them all over the floor of the stage or room the girls will be dancing in - the floor should be completely covered. They love to run through them and dance around in them. Make party guests their own tutu's. Let them make their own or start the tutu's and let them add pretty ribbon. See our Tutu craft page for complete instructions. Let guests paint and decorate a wooden picture frame with pink paint and embellish with pink boa feathers. More ideas on the picture frame crafts page. Record about 2 minutes of a pretty ballet song (record it over and over so you don’t have to keep stopping to rewind the music) and teach the ballerinas a simple dance. Before the party decorate a room to look like a stage and place chairs facing the stage. When the parents arrive to pick up the guests treat them to a performance. * If you can - record the performance and then mail a copy of it to the guests on a DVD when you send out thank you notes. For an easy dance that the girls can use quickly try this fun sing-song sung to the tune of Teddy Bear, Teddy Bear. Ballerina, Ballerina - Twirl around. Ballerina, Ballerina - Touch the ground. Ballerina, Ballerina - Up on your toes. Ballerina, Ballerina - Strike a pose. Ballerina, Ballerina - Take a rest. Ballerina, Ballerina - Take a bow. Ballerina, Ballerina - Curtsy now! Choose one player to start the game. She stands in front of the other girls - facing them - and begins to do a ballet dance. The other girls try and follow her moves. After two minutes switch ballerinas so everyone gets a chance to lead. For this relay race game you will need lots of tutu’s, 2 tiaras, ballet shoes, lipstick and other fun or crazy items that ballerinas would wear. Divide the guests into 2 teams. Each team lines up one behind the other and waits for their turn to do the relay. On the other side of the room set up a basket filled with the tutu’s and other items - one basket for each team. From each team girls race one at a time to the basket, put on the items, run back to the starting line, then run back to the basket and take the items off … then run back to the starting line and tag the next team member to go. All items must be in the basket before another girl can start. This game is even more fun if you have several (4 or more) tutu’s that the teams have to put on during the relay race. the circle. They must find someone to sit with. This is a funny game especially near the end when everyone is trying to fit on one chair. Played like Mother May I … except all of the steps are ballet steps. Choose one girl to be the “Ballerina” (mother) and have her stand at one end of the game playing area. Have the other girls stand on the opposite side facing her. One at a time the “Ballerina” calls the girls by name and says .. “Suzy, take one twirly step forward”. Suzy has to reply “Ballerina May I?”. And the “Ballerina” answers “Yes you may”. Suzy then takes one step toward the Ballerina in a twirling fashion. For every girl the number of steps and type of steps should be different. Some examples are: baby steps, leaps, twirls, steps in position 1 thru 5, etc. Played like Pin the tail on the donkey. Find a pretty poster or have a picture of a ballerina blown up life size. Before the party make a tutu shape from cardstock and glue little pieces of tulle to cover the paper and make it look like a tutu. Place double sided tape on the back. Let the guests make their own tutu’s. Easy to make tutu instructions. Make pretty charm bracelets for guests to take home. Decorate jewelry boxes or picture frames. Style the little ballerinas hair in high buns with flowers and let them put on sparkly make-up and fingernail polish (if okay with the parents). Pretty pink punch or pink lemonade. This is fun to do as a tea party also. Don’t put sugar in the pink lemonade and let each girl pour her drink from a teapot and put sugar in from the sugar bowl. (Sugar cubes are always a big hit!). Sandwiches cut into shapes with cookie cutters. Jell-O Jigglers are also fun cut into shapes like stars. Cut out star shapes from rice krispie treats and place them on dowels princess ballerina wands. Cut up fruit and place in a dish or skewer for fruit kabobs. Sparkle glitter makeup, nail polish or pretty hair bows. The tiara, tutu or any craft you make will also be the party favor the girls can take home. Pink Bubblegum, candy necklaces, stick on earrings. Wrap squares of pink tulle around the ballerian party favors and tie with a pretty pink satin ribbon. Place 1 or 2 small white roses in the ribbon or a little ballet slipper charm. Fill light pink paper bags with ballet birthday party favors. Fold over the top of the bag and hole punch two holes through the bag and the flap that you just folded down. Thread white or darker pink ribbon or tulle through the holes and tie in a bow. Attach strips of pink tulle to the top of a paper bag to make a pretty tutu.